1 – Reno to Beatty NV – Used Highway 95, good whole way, with some construction and short delays. Stayed at Beatty RV Park, small (30 +/-) spots, exceptional restroom / showers. 3 – Boulder City to Flagstaff AZ – Used Highway 93, then Highway 40, good road conditions, #40 four lane and thus easy driving. Slow gradual climbs about 35 miles outside of Boulder City all the way to Flagstaff. Stayed at J&H RV Park. Small (35 +/-) sites. Well maintained and quiet. Billed as a “senior & adult ” park. nothing difficult at all. Stayed in WATCHMAN campground within Park. Had electricity at each site, no water. Campground full, wanted to extend stay could not due to no sites available. Recommend reservations pretty far in advance. This campground most convenient, can walk to Park shuttle, and thus all hiking trails were available to us. 6 – Caliente NV to Hawthorne NV Used highway 93, then extraterrestrial highway, then highway 6, then highway 95. All road surfaces in excellent condition, Long slow gradual climb (4%,5% grade for 7 miles) out of Caliente NV. Not an extreme climb just long. 190 miles from Caliente to Tonopah…No fuel available!! No ATT cell phone service available for most of the run. Must have seen 8 or 9 cars on the extraterrestrial highway. The October 2011 Newsletter has been posted. Links to photo galleries and additional information mentioned in articles in this newsletter can also be found there, too. The SNU October rally will be at Scout Camp on the Carson river. The dates are Thursday October 20 – Sunday October 23, 2011. It is located just off Alt 95 just over the bridge from Buckland Station. It is right on the Carson River. Be sure and bring firewood for campfires. 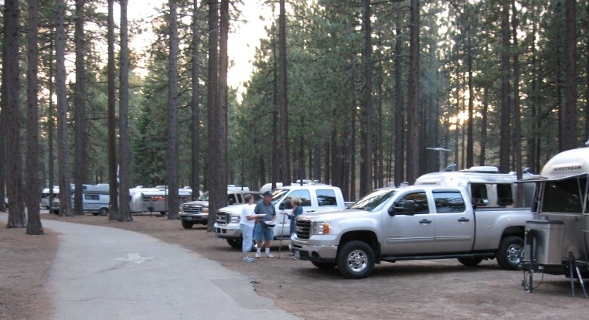 The challenge at the South Lake Tahoe campground was getting around the trees. That was the spot for the SNU’s 35th anniversary rally. Things were rather strange although camping in the trees without fully defined parking areas was as usual. The ground was flat and very little leveling effort was needed. There was electricity and water available. There were also event’s! Everybody formed a mob Saturday morning to walk over to the museum and then in the afternoon for the bus ride to the MS Dixie II mooring pier. See the index page for the SNU 35th Anniversary Rally & Dinner Cruise and check out the links to the photo galleries, history quiz, and other stuff. To get into the SNU history, check out the history index page.